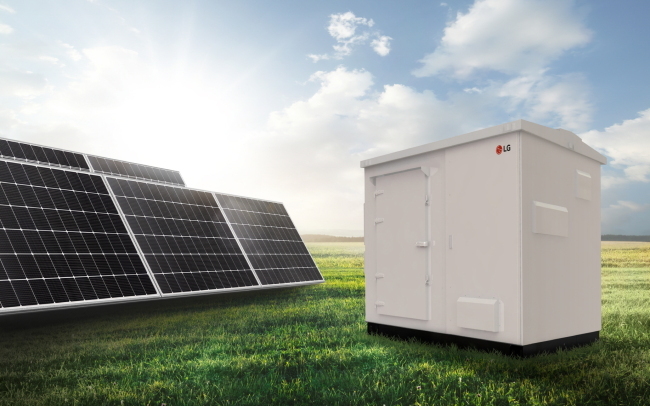 LG Electronics announced Thursday it will launch a 100-kilowatt energy storage system for solar power plants featuring LG Chem’s battery in an effort to expand into the ESS market. Named All-in-one ESS, the system is equipped with power-condition and power-management systems that increase efficiency and convenience for users, the company said. Adopting LG Chem’s 274-kilowatt per hour battery, the ESS is capable of storing electricity for one full day for 25 households in Seoul. The average daily power consumption is estimated to be 10 kWh for a single household. The latest product can also help small solar power plants raise profitability. If ESS systems are adopted, the plants can receive five times more renewable energy certifications approved by the government, which can be traded as stocks in the spot market.